and why some "invisible" lasers are so dangerous..
One thing noticable about lasers is that lasers with the same power output but different colors seem to have different brightness. 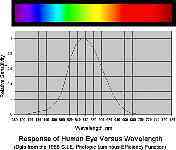 It is because the eye naturally is more sensitive to some colors than others. Therefore if I have three lasers, all the same power, perhaps 5mW (0.005 watt) and shine them on a gray brick wall, the red one will be dimmer than the green one, and the infrared one (800 nM exmple) will not even be visible. If I were to increase the power 200 times, to 1 watt (enough to burn paper), the red and green ones would make a spot so incredibly bright, you could not stand to observe the spot and would hurt your eyes trying to (Dont' do this). The infrared one, however, would only appear to be a dim red dot, about 1 millionth the brightness. Unfortunately, it is in fact just as brilliantly blinding as the red and green ones, and the eyes would as easily be damaged looking at the spot. There are also ultraviolet lasers, and they are just as invisible and dangerous as infrared ones. Always use laser goggles when using lasers over 5mW. By the way, a TV camera will nicely detect an infrared laser beam spot on a target. This is a very useful way to get alignments started when you can't see the beam. Since the eye does not detect a brilliant infrared spot and make the pupil contract, and make you squint and look away, you would not notice till later when you have a terrible headache or a vision problem. Maybe permanent. "Do not stare into laser beam with remaining eye" is not a joke. Lasers are not toys and I hope these charts will help make clear why non-visible lasers of any power level can be even more dangerous than visible ones. For a great deal more information, see Sam Goldwasser's Laser FAQ from which some of this information was unashamedly borrowed. This little page is mainly intended to caution experimenters and direct interested parties to a source of reliable information before something real bad happens. Be sure to read the safety sections and abide by them.